Last year’s Silver Proof Set from the United States Mint held out about two months longer than the one from 2012. The 2013 Silver Proof Set is newly listed as "sold out" and now on the Mint’s "No Longer Available" section of the website. Released on May 2, 2013 and last priced at $53.95, the set includes 14 proof coins with 7 in standard composition and 7 struck from 90% silver. Its silver weight logs in at 1.34 troy ounces, making it susceptible to two pricing changes last year after precious metals continued to fall. Collectors who waited to buy got the best deal. The proof set’s original issue price was $14 higher at $67.95. The price was trimmed to $60.95 on May 22 and then cut again to its final level of $53.95 on July 11. Sales as of Sunday, Feb. 2, had its total at 419,148, suggesting the U.S. Mint capped production close to or at 420,000. A few more could have moved, actually. Last week it was the Mint’s 14th most popular numismatic product. Coin News Update: The U.S. Mint updated sales of the set, lifting the total to 419,721. It is no longer reporting changes. The table below has been updated. Collectors caught sleeping may still order all of the coins found in the Silver Proof Set through separate United States Mint products. It’ll cost more. The 90% silver quarters are available in the 2013 America the Beautiful Quarters Silver Proof Set for $31.95. The same quarters, plus the 90% silver Roosevelt dime and 90% silver Kennedy half-dollar are inside of the 2013 Limited Edition Silver Proof Set for $139.95. That set also includes a 2013-W Proof Silver Eagle. 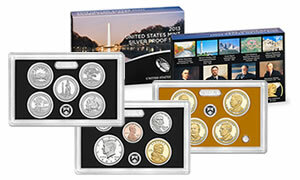 The clad coins are found within the regular 2013 Proof Set for $31.95. The 2014 Silver Proof Set has a U.S. Mint scheduled May release month with preliminary pricing of the same $53.95. How does the mint determine the number of sets it produces? Do they produce them by the month, quarter or 6 months?